I had a great time and enjoyed the trip and the Syncronaut fellowship. We had 8 Syncros, 17 adults, and 5 children attend. We went on 2 days of 4-wheelin' & sight seeing. Swam and kayaked in lakes, swam in creeks and joined the MogFest spectacle for a couple days. My traveling partners were my amazing girlfriend Deanne and her girls, Teagen (10) & Tehya (8), SyncroChicks 3 & 4. Trip Report 1 - Saturday & Sunday, August 11-12. We left the Los Angeles area on Saturday morning with 2 days of driving ahead. We traveled almost 12 rather dull hours through the heartland of California’s agricultural central valley. On the way, we got turned around in Sacramento goofing up the 99 to 5 transition. It was just as well as the goof afforded us the opportunity to drive through town past the impressive state capitol building and associated park. We kept moving north and stayed at a hotel in Redding. Yay a pool! That was refreshing at the end of a hot day in the van. The next morning in the shadows of Mt. Shasta, we accidentally met up with Edward Newcomb and his brother-in-law Peter as we pulled into Weed to get gas and leave Interstate 5 behind and head up US 97. About halfway between Weed and Klamath Falls we were stopped for a long while (an hour?) by a horrific wreck ahead that had cars backed up both ways for miles. Judging by the wreckage, I'd be surprised if it wasn't fatal. Very sad. Drive safely! While we stopped in Klamath Falls for groceries, Edward and Peter continued north. Hunting for a grocery store in Klamath Falls turned out to be about a half-hour adventure, but we finally succeeded and were on our way north again. Looking for a lunch spot we found a nice looking park along side Upper Klamath Lake. Unfortunately the air contained more gnats than oxygen and we kept looking, stopping by a shady fish hatchery instead. No bugs there – yay! We couldn’t come all this way and pass up a chance to see Crater Lake, so a diversion west of 97 had us make a half-circle around the beautiful lake with amazing blue water. Nearing the end of the day, just a few miles from camp we came upon our second wreck of the day, and overturned Jeep which appeared to be a single-vehicle accident. Stopping to see if we could help, we were told that help was already on the way and that the driver, while shook up, didn’t need immediate help. Another reminder to drive carefully. 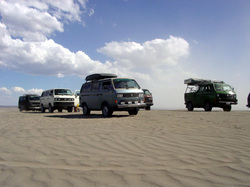 Monday our group took the first of the event’s 4x4 / site seeing trips. To mix things up a bit and provide for varied terrain, we decided to go make Monday’s trip, West from the Bend area into the pine covered mountains and Wednesday’s trip, Southeast into the central Oregon desert region. We left Camp Syncro at Lake Paulina about 9:00ish with a group of seven Syncros. We traveled mostly west into the Cascades taking a variety of paved and unpaved county roads past the Crane Prairie Reservoir and headed west on County Road 436 past Little Cultus Lake. Here’s there’s a nice campground right on the shore of the lake, but we continued west where the road narrows past this point. As the road got steeper and rockier, we encountered some 4WD portions, but they were pretty mild. Nothing required us to exit the van’s to plan our wheel placement or worth stopping to watch others venture up the terrain. Hoping the best 4-wheeling lay ahead we continued west to Taylor Lake, which made a very nice place to stop for a break. Here, the kids waded a bit and we all stretched our legs enjoying the time out of the vans. Continuing past Irish lake there were a few more sections of mild 4WD, again nothing to write home about. Soon we crested the ridge of the Cascade Range and headed down the west side entering the “Ghost Forest”, or so I called it. It was a forest that was consumed by forest fire years previous and an abundance of white and gray tree trunks covered the landscape as far as the eye could see. Quite an eerie sight! A number of the tree trunks were not simply burned, but some were broken in half as well. These break points might be 20’ off the ground or more and it appeared as if the top portion of the tree were snapped off like some giant tooth pick. I’ve heard that when trees get super heated in a forest fire they can literally explode at times and this seems like it might explain all the busted up trees we saw. As we traveled south through the Ghost Forest we noticed as we looked closer that everything was not dead. Small green shrubs were visible along the ground and new trees where here and there also, showing signs of new life among the dead tree trunks towering above them. These new trees ranged in size straight from little sprigs less than a foot tall to a few which were nearly six feet tall. It was a cool sight to see new life rising from the ashes of such devastation. Eventually the eerie black, white, and gray of the Ghost Forest yielded to the color and scent of a green, living forest again and we found a bit of pavement at the north end of Waldo Lake. We found a great spot for lunch with ample parking, picnic tables, and no other people right on the shore of the lake - a perfect spot. During lunch Edward asked about some odd electrical gremlins his van was experiencing, the alternator and O2 sensor lights occasionally flickering on & off together. We looked a the Bentley wiring diagrams a bit, measured the battery and charging voltage in his van and I felt it was most likely something goofy in the dash light indication circuits causing these lights to flicker. Kids waded and some swam in the lake as Gregory ran his radio-controlled boat and we lingered on the lakeshore soaking up the warm sun and enjoying each other’s company. After leaving Waldo lake behind, we were soon on dirt again (Nat Forest Road 4290) traveling east making a loop that would eventually lead us back to pavement and Camp Syncro. Passing a sign that read something like “CAUTION - TRAVEL AT YOUR OWN RISK! UNMAINTAINED ROAD AHEAD!”, I thought to myself, “Great! Now for some 4-wheeling fun!”. But it was not to be, this road had been recently graded and it was about as broad and as flat as a dirt/gravel road could be. Spying out alternative routes on the map, we turned off onto a smaller road looking for some challenge, but mostly it was simply narrower, but just as flat. So, narrow that the pine needles brushed against the vans at times, all the while I’m thinking of Craig’s nice Escorial Green paint on his 16” DoKa and not wanting to scratch it. We stopped a few times to break off branches and once to remove a big fallen limb hanging over the trail that was high enough for most vans to pass under, but I knew the rack on Craig’s was too high. At one of these stops, Edward’s van would not start again. Hmmm - seems it wasn’t a false indication problem after all, but something more. The ground was too level for a push start, so we hooked up a strap and gave his van a pull start and we were on our way again, no longer looking for 4WD challenges, but simply to get Edward’s Westy back to camp without further trouble. Before long we discovered this wouldn’t happen, his van simply died while driving. We needed to figure out the problem and fix it or plan to tow him back to help. With the alternator light flickering, we focused on the alternator / voltage regulator and first wanted a look at the voltage regulator. Once it was out of the alternator we could quickly see that it was clearly warn and one of the brushes was warn much shorter than the other and appeared perhaps not to have been touching its contacts point in a while. I dug out my spare voltage regulator, but it was not an exact match for Edward’s. Brian found his spare alternator and it had a near-identical regulator. We installed it, pull-stared Edward’s Syncro again and we were on our way. This time without the flickering lights. It was fixed! Ahhhhh, Edward could breathe again. The rest of the group headed to La Pine for gas and then back to Camp Syncro, while Jonathan and I (with Deanne and the girls) went in search of a decent map for Wednesday’s adventure. Trying a couple of sporting goods stores and a Visitor’s Information Center in Sun River and Bend, yielded no map of what we were starting to call “The Badlands” or “The place with no map”! Got gas, headed back to Camp Syncro. After dinner there was a nice time around the campfire making and enjoying “Campfire Éclairs”. Thanks Deanne!!! Thus ended Monday, August 13th. Tuesday was a day without driving, or at least not much of it. We had all been in our Syncros for at least a day and some up to 3-4 days including the trip to Oregon. After breakfast, we spent a while doing a Syncro “Show & Tell” where we each got to look at the other vans in the group and talk about everything Syncro. We spent the remainder of Tuesday in various recreational activities including hiking, biking, napping and kayaking. For dinner, it was the “Taco Tuesday Potluck”. Here, everybody pitched in and we had a big group dinner of terrific tacos and big burritos! It was GREAT! - thanks everyone! Dan Fleming joined our band of Syncronauts Tuesday evening. Wednesday was big day this week as the group saw many varied sights and covered a lot of ground. While Brian & Gregory Smith left camp for home, the rest of the group headed out for a day of adventure. We left camp about 9:00AM in a generally southerly direction and travelled along a number of graded and dusty (DUSTY!) forest service roads. 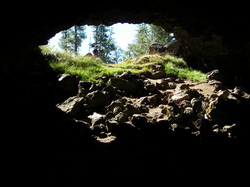 Ice Cave: Our first attraction today was “Ice Cave”. It was a large hole in the ground which most times of the year contains ice just 30 or so feet from the entrance. While there was no ice this year some were heard to say “Wow! It’s really, really cold in there!” and they were right. It was amazing to go from very hot at the surface (upper 90’s?) to down in the 30’s in the cave. People were shivering in their sweatshirts. 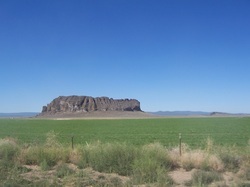 Fort Rock: Next on the agenda was Fort Rock, a large solitary rock formation rising out of the otherwise flat plain akin to Ayers Rock in Australia, but smaller. This is how it appears from the north anyway. Looping around and parking on the south side, one could detect that this was not a single solid structure, but a ring of an extinct volcano crater. We took the short hike up to the southern and lowest part of the rim and looked inside the ring and surveyed the surrounding landscape from our elevated perch. The volcanic rock here has sort of a hollow sound and feel to it due to the gases entrained while molten. Fort Rock was said to resemble “Disneyland Rock” - the man-made “rocks” used in rides like the Big Thunder Mountain Railroad ride. Crack-in-the-Ground: A simple name that doesn’t exactly inspire one to travel long distance to see it right? Who’d wasn’t to go see a crack in the ground? Well, you should as this place was really cool in a couple of ways. If you visit get directions because it’s not visible while on the road and it’s not exactly apparent where to stop. When you find it, you’ll be amazed at the micro-canyon ecosystem in this fissure in the desert floor. It’s a crack about 20’- 40’ wide and about 30’ - 40’ deep. We entered the crack along a pathway that leads down into the crack that’s narrow enough at points to squeeze sideways and large enough to have small trees growing at the bottom. 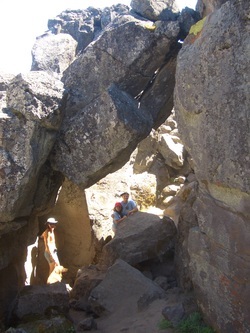 There are many interesting rock formations in the crack. We started noticing some resemblences to other objects, a rock that looked like a skull, another like a pig’s snout, a saddle and a door, shelves, arches very fun! It’s a cool feature to see and walk through, but it’s also cool as the temperature is about 20-30 degrees cooler than the surface. Our group hand lunch gathered under a small shade tree by the roadside before entering and by the time we’d made the 1/4 mile walk to Crack-in-the-Ground it was mid afternoon and temperatures up to about 100 degrees. Walking down into the crack was very refreshing as the temperature in the shady crack dropped into the very comfortable 70-75-ish range. It felt like the crack was air-conditioned! We walked though the crack in pretty much a straight line for about 3/4 mile or so and then the pathway brought us up to the surface again at the same spot we entered. Yes, that rock was there, and that tree was there, etc. How could we have gone in a circle?! That doesn’t make sense. After a few minutes, we starting noticing differences between this spot and where we’d actually entered. Although very similar, this was of course not the same spot, but just one that looked like its twin. A very strange experience. Sad to leave the air-condition behind, but we were now off to find the sand dunes. Christmas Valley Sand Dunes: Continuing south and then east from Crack-in-the-Ground we found our way to the Christmas Valley Sand Dunes. This is an established OHV open area of about 11,000 acres of shifting sand dunes. While dunes are not the Syncro’s forte, we did manage to have some fun on them. Our group first encountered a small dune at the end of the dirt road and with a few attempts we all made it up to the top. From there we could see some of the bigger dunes nearby. While our group chatted about what to do, Edward seized the moment and decided to try a frontal attack straight up the steep face of the big dune. Several attempts were made, but he just couldn’t seem to get up about the last 100’ or so of the face. Bill Langan decided that he’d had enough watching and was ready to scale the dune for himself. Taking a round-about route, we soon saw Bill’s Syncro appear on the top of the due ridge, silhouetted against the blue sky. Before long the rest of us followed Bill and Edward made his way up the steep side to meet us at the top. We all felt pretty good about getting to the top and the view from there was great. The wind started picking up and before long instead of taking pictures we were taking cover on the leeward side of the Syncros or jumping inside. The blowing sand was not exactly inviting us to stay for a long visit. Deciding to head back down, we took several routes back to the road. I took the route straight down the face of the dune in what turned out to be somewhere between 4-wheeling and sledding as I could feel the tires partially roll and partially slide straight down the dune. Great fun! In about 10 minutes our group of Syncros were back on the graded dirt road and headed back toward camp. The wind kept picking up and over our shoulder we could look back toward the top of the dune we’d just left. While we could look toward it, we couldn’t actually see it because it had become engulfed in a wicked brown sandstorm that was covering the dunes. We’d picked a very good time to leave! We visited a very accommodating auto/tire shop in the thriving metropolis of Christmas Valley (OK, it’s pretty much just an intersection of two of the area’s few paved roads!). The people there were very happy to help us air up our tires and we were on our way. Heading back to the highway, we could tell we’d had a very long day and discussion over the radios centered on how much fuel each of us had left, how far it was to the gas pumps, what we estimated our fuel range to be and whether or not we had a siphon hose to transfer gas. Fortunately we didn’t need to resort to that, but suffice it to say, several of us were very short on fuel by the time we made it to the pumps.